Crazy Egg is proud to introduce our new Bundled subscription plans in the same great flavors you're used to Pro, Plus, Standard, and Basic. Learn what your customers are doing on your page when they visit your page, through your Snapshot reports. Follow their journey by viewing recordings. And make your conversions count by heightening your visitor experience through AB testing (to find what works best). Note: A Pageview is based on running Snapshots and/or AB tests. Interested in Enterprise pricing? Contact us to learn more. Explore all the Crazy Egg features that will help you build a better website. 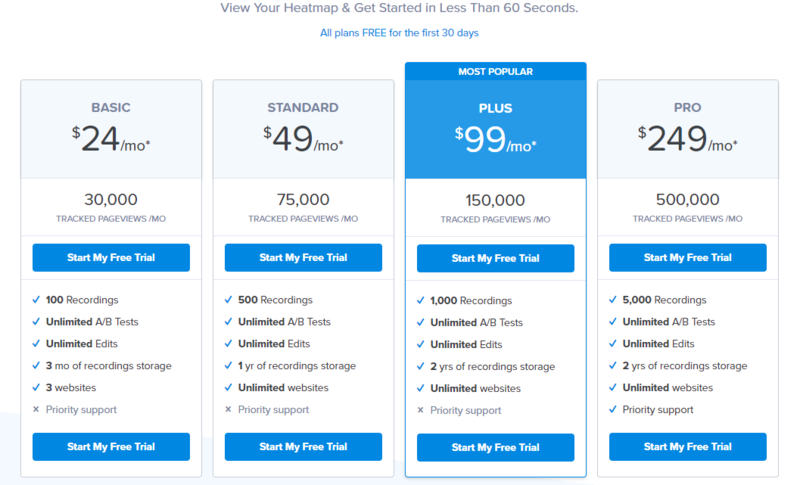 Check out our Pricing page to get started! 1. Navigate to your Snapshots Dashboard, your A/B Testing Dashboard, or your Recordings Dashboard. Find the sidebar on the right side and click on Upgrade now. 2. Locate Account on the sidebar on the left side and select Your profile. On your profile page, you will find a section titled Subscriptions. Click on Change plan, which will give you access to the Upgraded Plans.